Written by: Nick Arrietta on February 2, 2010. This week’s review features the Taylor Custom Electric. The Taylor Custom Electric features new Taylor pickups, a sleek all-aluminum bridge and neck-to-body construction. The unique Taylor-designed pickups are the foundation on which the Taylor custom was built. The Custom is loaded with full size open-coil humbuckers featuring a new type of magnet and special winding process. The combination creates vintage humbucker sound with the power and dynamic range of modern pickups. The Taylor Custom has five pickup settings with carefully chosen voicing that give you a great range of tones. Position 1 sets the neck pickup. Position 2 sets what’s called the two inside coils from both pickups wired in parallel. Position 3 sets both coils of the neck pickup, combined with the inside coil of the bridge pickup for a classic bright single-coil tone with the added fullness of neck tone. Position 4 sets the two inside coils from both pickups in series (north from neck and south from bridge) creating in effect, a 4 inch humbucker. Position 5 sets the bridge pickup to stand alone mode. The sapele wood body with walnut top is beveled on the back, sides and in the cutaway so you’re always playing in comfort and able to easily reach the upper frets. 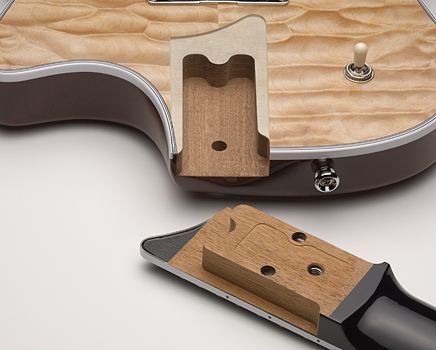 The mahogany neck uses a single bolt T-Lock neck joint that pulls the neck into the body. The Taylor-designed aluminum bridge is smooth across the top with no exposed adjustment screws to clutter the sleek look. The knobs have an elegant look with a lipped edge that allows great one-finger control. Taylor also includes rubber O-ring grips that will slip over the knobs. The Taylor custom electric has a 22 fret 24-7/8″ Taylor short scale neck giving it superior feel and playability. With the 15” radius ebony fretboard, you get a clean fast accurate tone with every chord hit. The Taylor custom electric uses specially designed Taylor tuners that keep excellent string tension and tune. My over all opinion of the Taylor Custom Electric is what I have come to expect from Taylor, truly great quality and construction. It feels great and plays great. Being a high end guitar you will pay a good chunk of change for it but it is truly worth every penny. The Taylor Custom Electric sits around the $2300 – $2800 dollar range depending on the wood and color features you choose. The Taylor Custom Electric comes in Sapele or Koa with a gloss finish. Its unique tonal spread was a nice change in pace for an electric guitar. I could set classic rock tones through clean almost acoustic clean tones, very versatile. I wasn’t happy with the expensive price tag but what do you expect it’s a Taylor… you get what you pay for. This guitar will not be for everybody, but it will sure make an impact on players that are looking for a new sound and look from a classic guitar company. I give it a 10 out of 10 rating. This is a great guitar that will give you killer tone and everything that you need in a modern axe. Check it out, this might be what you have been looking for. Till next week, thanks for reading and keep shredding.